The first of the three waffle weave towels is done and I'm halfway through the second. This is the 'Martini' colorway from Halcyon Yarn; I'm not quite sure how teal blue relates to martinis but I'm not complaining since it's my favorite color. 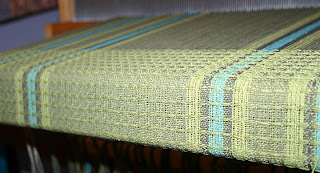 The weft for the third towel is the darker green that's on both sides of the blue above. I was going through crochet withdrawal - I haven't had a project on the hook for almost a week - so I started a baby blanket tonight. It's a feather and fan pattern using two strands of stashed baby yarn held together, one white and one a variegated blue. 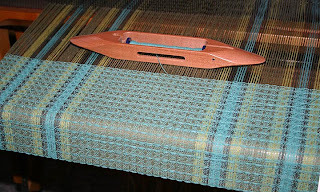 Since I have more white than blue, I'm going to do stripes with two strands of white every three rows or so. If it turns out like I'm picturing, this will be a gift for a friend's soon-to-be grandbaby. If it doesn't, I'm sure it will find a good home in my LYS's charity bin.